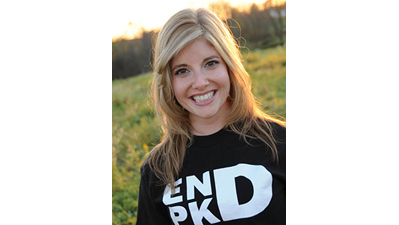 Since age five, Valen Keefer has battled and triumphed over seizures, scoliosis surgery, pancreatitis and polycystic kidney disease (PKD). After undergoing dialysis and more than 70 blood transfusions, Valen “won the war” when Sally Robertson gave her a kidney on August 13, 2002. Valen reflects on her transplant journey. As one health issue mounted on top of the next, I did not have time to process the reality of my life as an 18- and 19-year-old. I was battling polycystic kidney disease, in addition to many other health hurdles, and had been in the hospital close to one year. While my kidneys were functioning at 60 percent, the cysts on my kidneys would not stop bleeding. My team of doctors at Johns Hopkins made the difficult yet life-saving decision to remove both of my kidneys. I was immediately placed on dialysis. I didn’t know it at the time, but my family and I were in our own secluded bubble battling for my life. We were not aware or informed of any resources, organizations or people that could have helped educate and support us along our journey. This is one of the reasons I share my story and am passionate about helping others. I don’t want others to feel alone. I want them to have the information and tools to become empowered and educated to help themselves, and to have the best quality of life possible. I was too sick to be put on the transplant waiting list, but needed a kidney transplant to survive. Living donation was my only option and we had no idea where to begin with that venture. I was so ill that my family and I could only focus on one day at a time. Luckily, word-of-mouth about my condition spread among friends and family and I was fortunate to have some of my dad’s coworkers and friends step forward to get tested. I was blessed that after testing, two women were a match for me. As I prepared for the transplant, I tried to get my body as healthy and strong as possible prior to going into surgery. Our support and guidance came from my doctors, hospital staff and social workers, and especially my nephrologist. Patients should take the best care of themselves, exercise (based on what is possible with their state of health and recommended by their doctor) and prepare mentally with a positive outlook as the date approaches. When I opened my eyes post-transplant, I instantly felt alive for the first time in a while. I didn’t realize how poorly I felt until a healthy kidney was placed in my body. I woke up energized, with a smile on my face. It was the easiest surgery I have had, and I’ve had many. One of the first things I said was, “I want to go for a walk.” This made everyone in the room smile. I listened to their advice, which was to rest. Since that time, every new day is a miracle. Thanks to my organ donor, Sally Robertson, I have been able to discover the strong, passionate, giving woman that I am. I’ve been able to work full-time, have my biography published, and travel with my husband Noah on a month-long cross-country move from Pennsylvania to California in 2010. I rode on the Donate Life float in the 2011 Rose Parade, have shared my story at more than 80 events across North America, hiked huge mountains, and got married on a granite foundation at Glacier Point in Yosemite National Park. The past twelve-and-a-half years have been the most extraordinary of my life. My life is better post-transplant, because I am healthy enough to finally live as life should be lived: to its fullest with every cell of my being. I continue to be in awe by what our bodies can endure and overcome, and how well we can adapt to change. Our bodies are mysterious yet miraculous; we often underestimate them and ourselves. I am amazed every day how I carry a part of a fellow human being inside me and that is what keeps me alive. I am thankful for modern medicine and the 20 daily pills that keep me alive as well. This journey takes a whole team: medical professionals, family, friends, and the community. I am living today because of the medical “army” and loving “soldiers” who have fought and stood by my side. Welcome support and be thankful for it. We can’t do it alone and no one should have to. I learned selflessness at its finest and that miracles do happen. I’m living proof. Looking back, I vividly remember one day when I was waiting for my transplant. My family was called down to say their goodbyes because they did not think I would make it through the next emergency surgery. I wish at that moment we were told how beautiful life would be for me once I received a transplant. I wish we had been given some kind of hope at that moment when we needed it most. Whatever stage of transplantation you are in, I hope my story can give you a glimmer of hope. For the fighters on dialysis, remain hopeful, determined and diligent in finding a living donor because the quality of life post-transplant is indescribable. Sharing your story is the best thing you can do for yourself physically and mentally. It’s easy…just speak from your heart. People connect, understand and relate to heartfelt words. People want to help people. They just don’t always know what to do or how. You never know in life unless you try. I suggest you try. Your life is worth it and in your hands. For the fortunate who are about to receive a transplant, the preparation and unknowns of what life will be like post-transplant can be intimidating. Trust that you are strong enough to overcome and adapt to whatever changes need to be made. You are going to receive a second chance at life; not everyone is so blessed to be able to say the same. I hope you live each day to the fullest with a grateful heart and join me in showing donors how much we appreciate our new lease on life. For the selfless angels considering donation, I am grateful that you have made it to the point on deciding whether to be a donor. I live my life in hope to illustrate to donors how impactful and life-changing their donation is, how appreciative we (transplant recipients) are of them and how their selfless gift can transform someone’s life. I can never thank my donor enough, so I aim to make her proud of her choice by how I live my life. I hope my life showcases the impact you may have on someone else’s life and encourages you to become a donor. Please consider giving someone else a second chance like I have been so fortunate to have been given. By doing so, a miracle will unfold right before your very eyes. It will be a gift that keeps on giving. To learn more of Valen’s triumph over adversity and to follow her weekly inspirational blog, please visit: www.pkdwillnotbeatme.com.